NHS England has said 21 people are in a critical condition following Saturday night's terror attack in Central London. Seven people were killed after three male attackers drove a white Renault hire van into crowds on London Bridge before stabbing people near Borough Market. Six of those who lost their lives were pronounced dead at the scene. A Canadian national and a French man are among those killed. A total of 48 people - including foreign nationals from Spain, Germany, New Zealand and Australia - were hurt in the attack, and 36 of them are still being treated in hospital. France's foreign ministry says seven of its citizens were wounded, and four are in a critical condition. Another French national is unaccounted for. The three attackers, who were wearing hoax suicide bomb vests, were shot dead by armed police within eight minutes of being alerted to the incident. 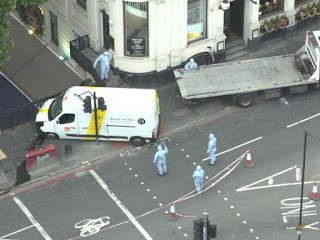 Scotland Yard said a member of the public also sustained a gunshot wound as eight officers fired an "unprecedented" barrage of 50 bullets at the attackers. The Metropolitan Police are "increasingly confident" the three attackers were the only ones involved in the attack, and officers say they are making "significant progress" in identifying them. Investigators are on the hunt for possible associates who might have been involved in plotting the atrocity.